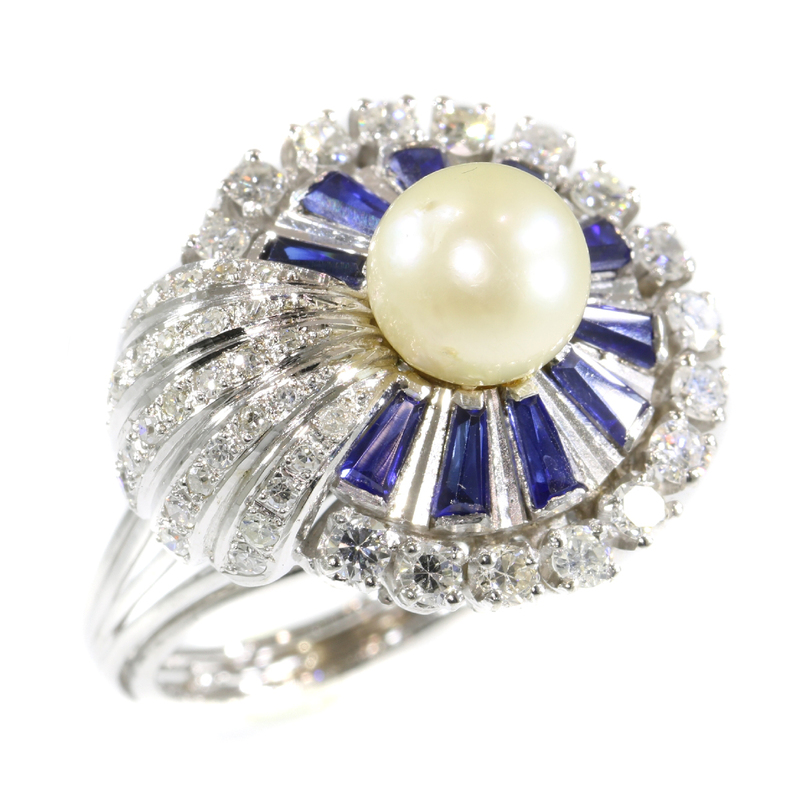 Vintage platinum diamond sapphire and pearl cocktail ring: Description by Adin Antique Jewelry. Diamond(s): 16 brilliant cut diamonds with an estimated weight of ± 0.96ct. (colour and clarity: H/K, si/i). 29 single brilliant cut diamonds (also called 8/8) with an estimated weight of ± 0.70ct. (colour and clarity: H/K, si/i). Total diamond count: 45 pcs. Total diamond weight: approx. 1.66 crt. with an average colour and clarity: H/K, si/i. Precious stones: Ten sapphires (lab produced) (also called verneuil sapphire). The fact that these stones are lab produced has no influence on the value of this jewel. Natural sapphires and lab produced sapphires were both used in this era, rather more for their effect than for their intrinsic value. Birthstones: Diamond is the birthstone (or month stone) for April, sapphire for September and pearl for June.